The composition of this shot was a little disappointing, I feel the broken window frame detracts from the subject, however… This location had a glimmer of a human story. 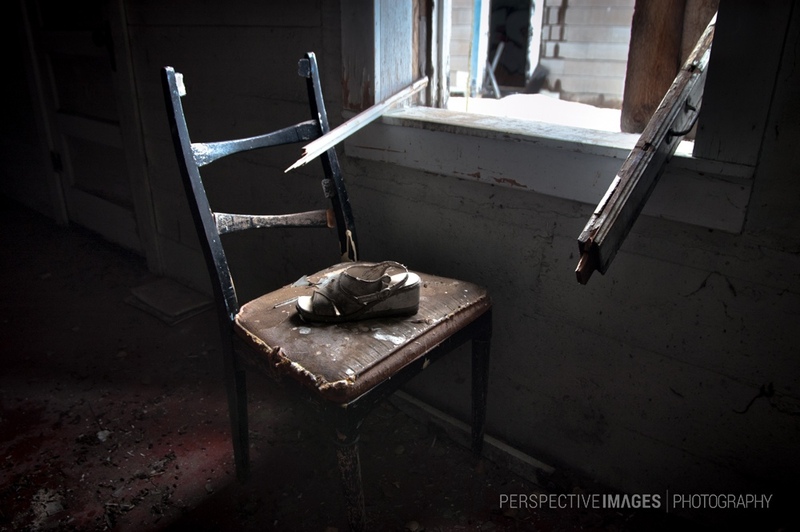 This chair and woman’s shoe were sitting the basement of one of the abandoned houses in the ghost town, the house was more overtly decorated in 1970’s chic than other buildings. Along with the chair and shoe was a series of woman’s magazines dating back to 1976 and birthday card addressed to Lucy, from her sister, nephew and niece. These fragments of evidence suggest “Lucy” was a long time resident all the way up until the towns evacuation in the mid 80’s.